Antigua and Barbuda are islands situated in the eastern Caribbean Sea. The capital of Antigua is St. John’s. 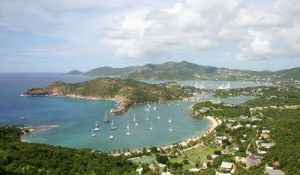 Antigua features a beautiful coastline with reefs and shoals and warm temperatures throughout the year, making it the destination of choice for people wanting to relax. Antigua’s primary language is English. It was visited by Christopher Columbus in 1493 and named after the Church of Santa Maria de la Antigua in Sevilla in Spain. Later it was colonized by the English and shortly after raided by the French. Around the 17th century, the islands became the place for sugar production. Fast forward to the 1960s, Antigua remained an associated state of the UK, but was self-governing. On November 1, 1981, Antigua and Barbuda achieved its independence, and today it welcomes visitors from around the world to come enjoy its natural wonders.